Wasps though ran in 36 unanswered points in a superb second-half performance. Wasps romped to a 51-10 bonus-point victory over Leinster at the Ricoh Arena, meaning they progress to the quarter-finals of the Champions Cup as Pool Five winners. Toulon’s failure to pick up maximum points against Bath allowed Wasps to take advantage with a devastating second half performance against the Irish province. Dai Young’s men scored seven tries to inflict the heaviest defeat in Europe for three-time winners Leinster, who will be desperate to forget their dismal campaign. 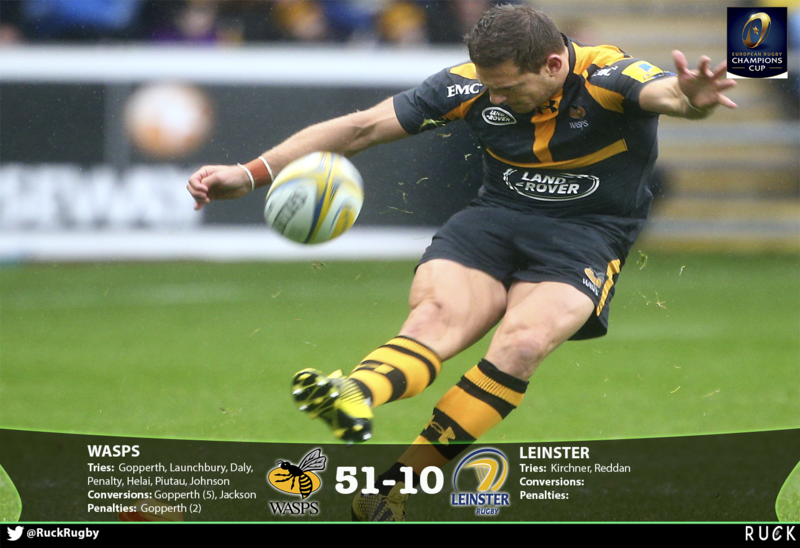 Leading 15-10 at the break, Wasps scored five tries in the second half, with Leinster mere spectators at times. Leinster made a dream start as Kirchner crossed in the corner after just three minutes. Sexton though was off target with the resulting touchline conversion. And there was then a worrying sight for Ireland fans soon after as Sexton went off for a head injury assessment following a collision with former team-mate Brendan Macken. The number 10 did not return. Wasps responded with Gopperth scoring against his former club following a lovely dummy in the 11th minute. The Kiwi number 10 then converted his own try to put the hosts in the lead for the first time, 7-5. Five minutes later Launchbury galloped down the wing for try number two for the hosts following a superb offload from Dan Robson, but Gopperth couldn’t add the extras, 12-5. A penalty try, converted again by Gopperth, on 53 minutes wrapped up the bonus point by Dai Young’s side were in no mood to take their foot off the gas. Frank ‘The Tank’ Halai got their fifth of the afternoon with a simple finish in the corner after the Leinster defence had been pulled all over the field. Gopperth converted to make it five from five for his afternoon before he was replaced. With nine minutes remaining a misunderstanding in the Leinster backline allowed Charles Piutau to scoop up the loose ball and race under the posts from 40 metres. This time Ruaridh Jackson added the extras. Ashley Johnson then got try number seven with the final play of the match. Daly sent a timely reminder to England coach Eddie Jones of his ability after he scooped Man of theMatch for a hugely impressive performance.